1 of 2 If necessary, trim membrane from steaks by pulling it away in one piece. Place steaks in a baking dish, rub with garlic and oil and marinate, chilled, for at least 30 minutes and up to 24 hours. 2 of 2 Prepare a grill or heat the broiler. Season steaks generously with coarse salt and grill over glowing coals or direct heat on a gas grill for about 3 minutes on each side, turning once, for mediumrare. (Alternatively, broil steaks 3 inches from heat for about 4 minutes on each side.) Transfer steaks to a platter and drizzle with lime juice. Let stand, loosely covered with foil, for 5 minutes. Cut diagonally across the grain into thin slices. 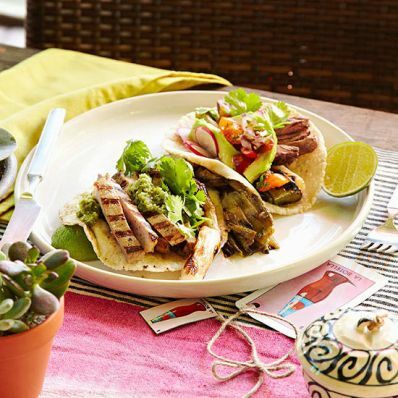 Make tacos with tortillas, Charred Spring Onions, avocado, radishes and cilantro, if desired.